Join our Honorary Cajun Card program! Membership is FREE! Pick up your card at any location, then register your card to begin earning rewards. Dine and earn points. 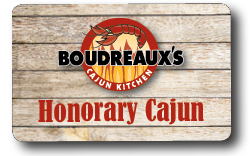 Get 1 point for every $1 you spend* on purchases at Boudreaux’s Cajun Kitchen. Points post to your account within 48 hours to your account from date of purchase. *Does not include tax, delivery charges and certain other exclusions. Once you accumulate 100 points, your reward will be available on future dining purchases with Boudreaux’s Cajun Kitchen. Click here to check your balance. (Card must be registered). Nope! It is free to sign up and earn points. There is no ongoing membership fee. Login to your account using the card number and phone number registered to the account. Send an email with the card number to honorarycajun@go-cajun.com, and you will be contacted with account information. When can I begin earning points? You can begin earning points for qualifying purchases immediately. You must register your account to earn rewards. No problem! 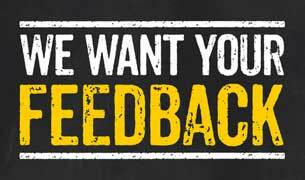 Click here to send us an email.